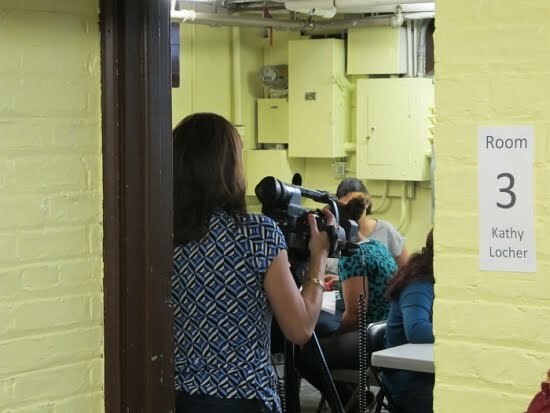 Recently, NY1's Arlene Borenstein came out to Woodhaven to visit the School Sisters on Notre Dame Educational Center for Women,. She was highly impressed with the center, the staff, and especially the students. There was an air of excitement in the center as Ms. Borenstein made the rounds, meeting Sr. Cathy and the rest of the staff and sitting in on some of the classes. Two reports were filed, one in English and one in Spanish. If you haven't seen them, here they are. First up is the English version, featuring Executive Director Catherine Feeney. What wonderful reports - a great way to spread the word on the wonderful work we are doing here at the School Sisters of Notre Dame Educational Center for Women. Below, from left to right: student Nereida Padilla, Executive Director Catherine Feeney and NY1's Arlene Borenstein.